Mark Cook is an artist working in Guernsey; his work has been exhibited in the National Portrait Gallery and other galleries in the UK. He has work in private and public collections both in Guernsey and in the UK. This painting is one of twenty that will come to make up The Hauteville House Project (Hauteville House was Victor Hugo's house in exile on Guernsey). Each painting though complete in itself is a fragment of one portrait, the living entity that is Hauteville House and the people who work within it. Victor Hugo designed Hauteville house to be a self-portrait, an illustration of his ambitions and ideals, built into the very fabric of the building. Into this the guides who work there each summer bring their own enthusiasms and personalities. 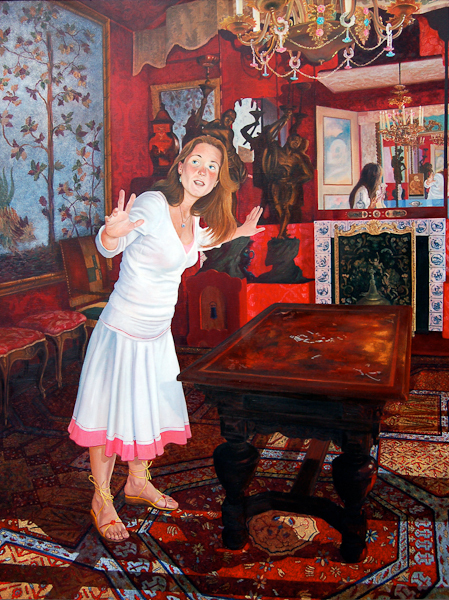 The portraits of the guides become portraits within a portrait, overlaying all of which are the artist's own obsessions; the paintings are dialogue between the place, artist, sitter, the past and present. This project will be finished for the summer of 2010. The completed project will then go on exhibition.